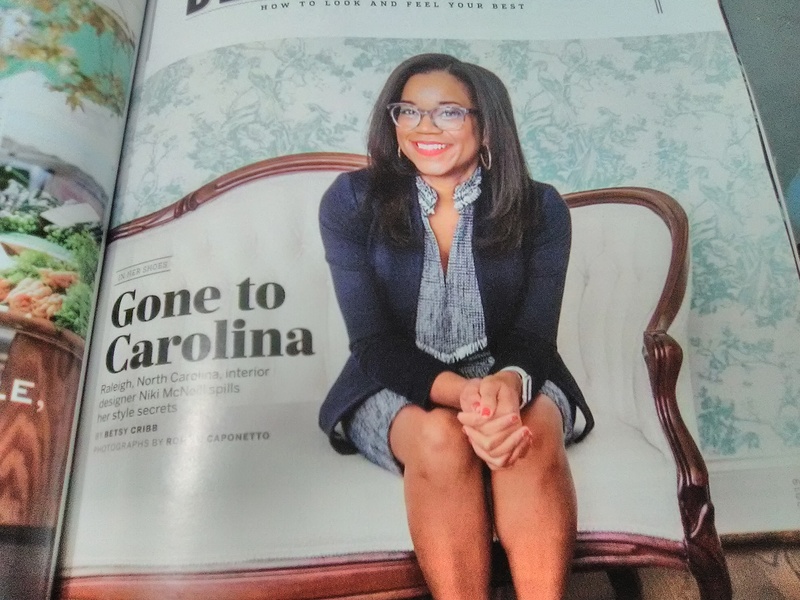 These are from the March 2019 issue of Southern Living. The first three designs are by Stroheim. 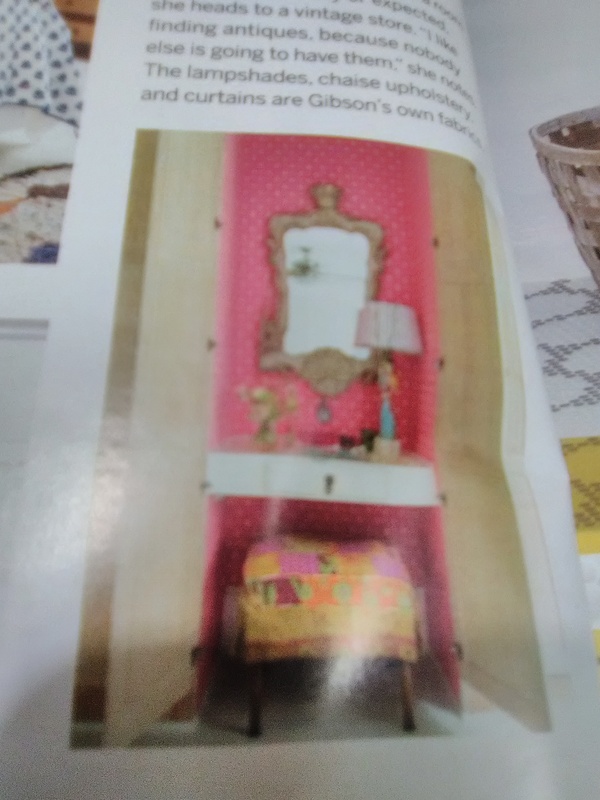 One adds cherry color to an entry, one is a subtle backdrop for a comfy farmhouse-style dining room, and one is an unexpected pop of color in a tiny vanity area. 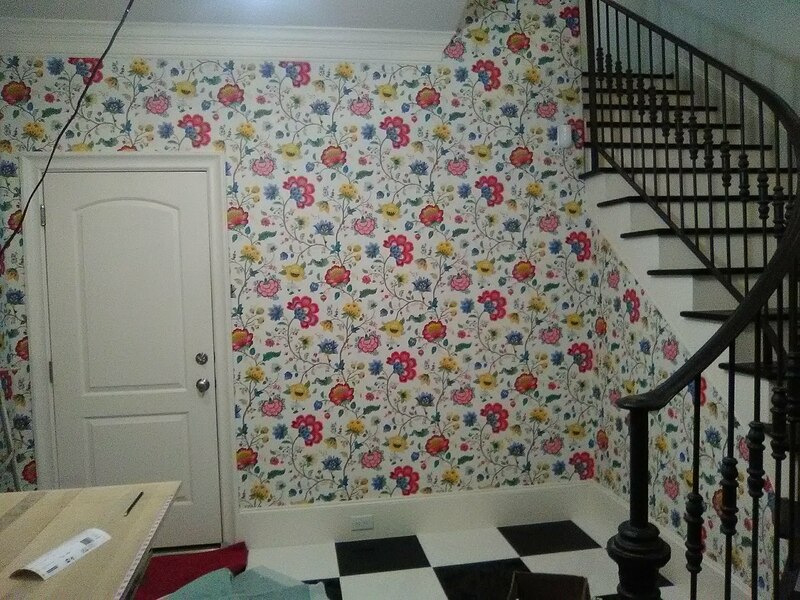 The wallpaper in the last photo is unnamed, but it’s a beautiful setting for a classy southern lady interior designer. Wow – Not many people get to sleep in a bedroom like this! 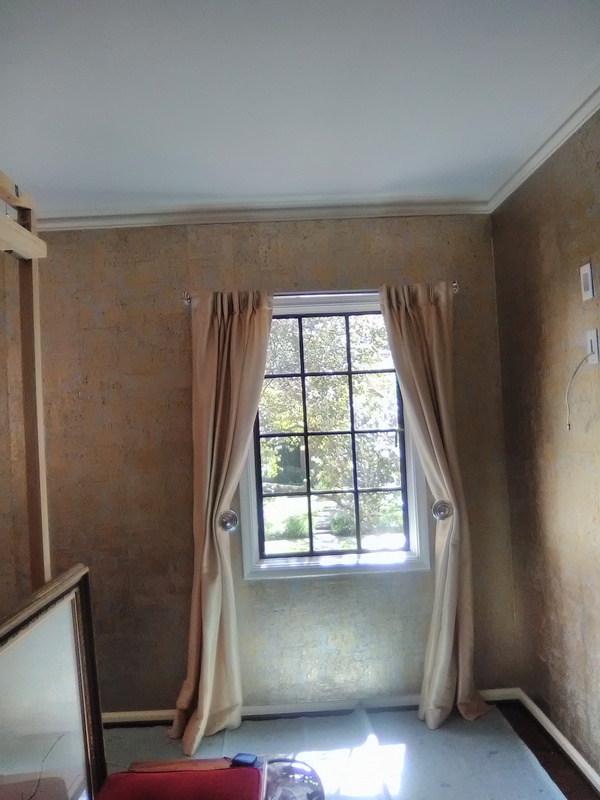 The walls are covered in a cork wallcovering that is coated with silver metallic blocks that are about 6″ square. 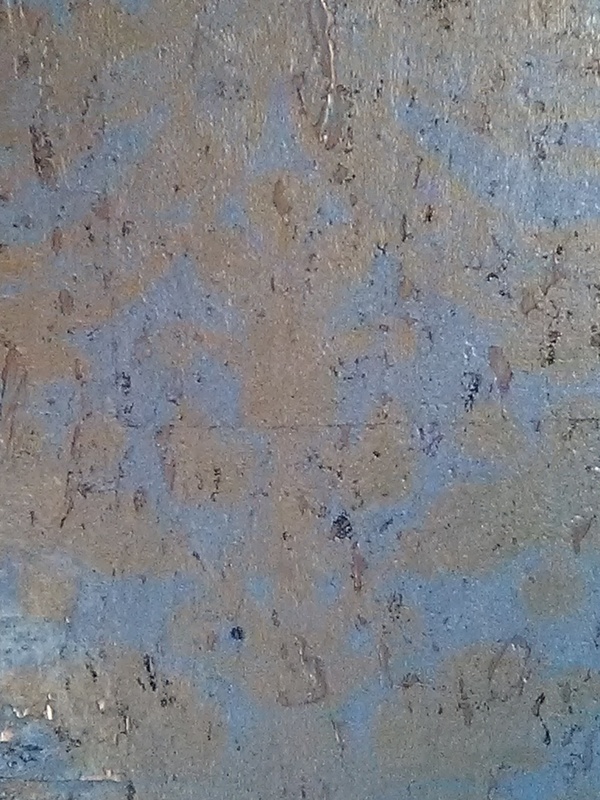 Then a gold metallic damask pattern was superimposed on top. 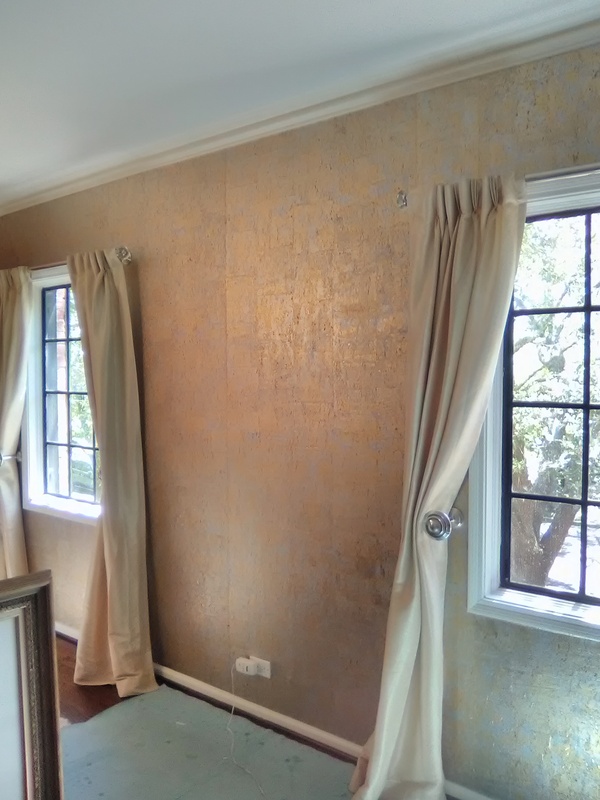 It looks like someone rubbed gold leaf on the walls! The result is an elegant, shimmery, somewhat edgy look. It’s all complimented by a deep red accent wall composed of large, 3-dimensional square blocks (visible on the left in the top photo). The bed and headboard sit in front of this red wall. Silver, gold, red – stunning! Cork is a natural material (like grasscloth, as an example) so irregularities and color differences are to be expected. In the top photo, you can see a vertical line down the left edge of one strip – I believe this to have come from a roller at the factory that was pressing too hard, or perhaps was too hot. Beyond that, there are differences in color and sheen and pattern between the strips on the wall. All of this is normal, and not considered a defect. 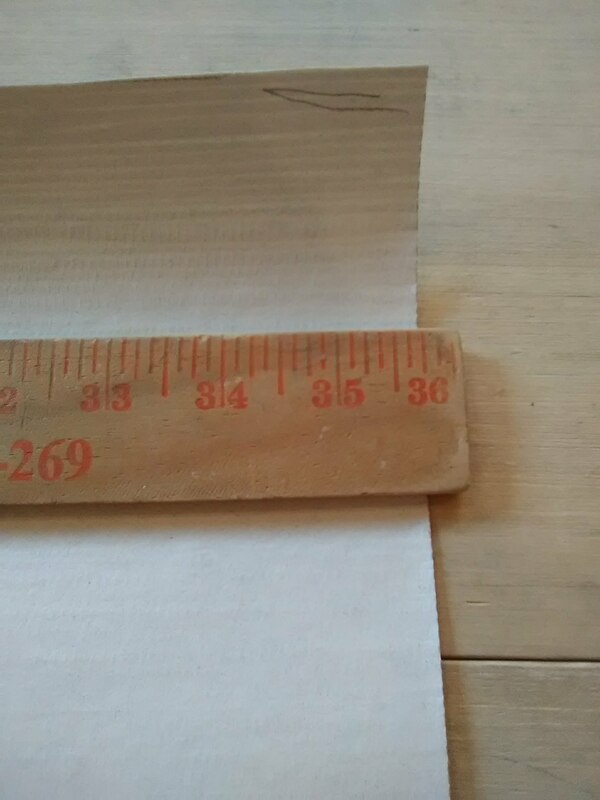 This was a thick material and took a lot of strength to press tightly against moldings for trimming, and it was pretty difficult to work around outside corners. But the main obstacle was that it was all but impossible to see the pattern. 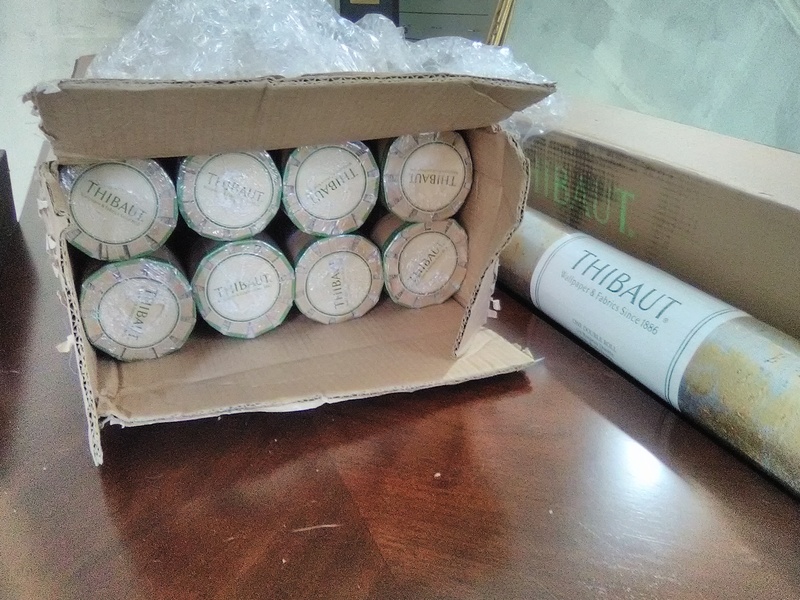 The sheen of the silver and gold, and the scratchy look of the design, printed on the textured surface of the cork … all combined to drive the installer’s eyes crazy. 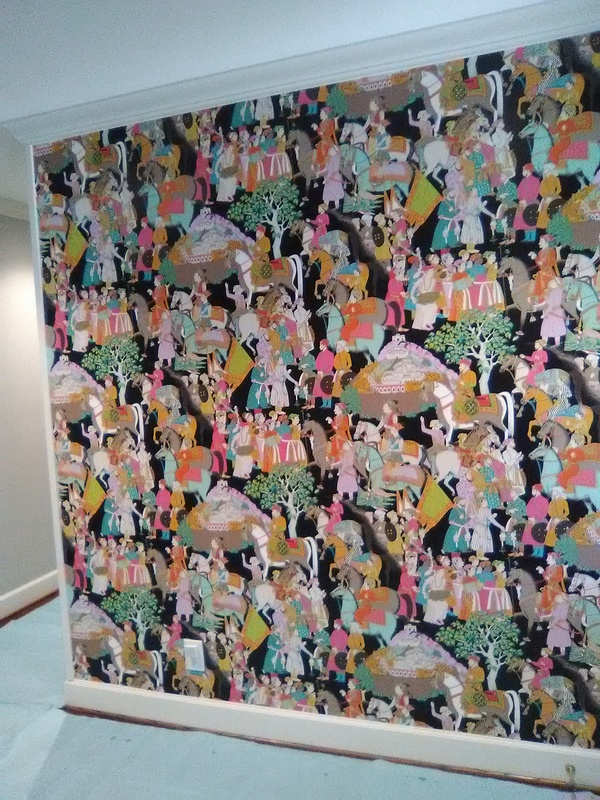 This wallpaper pattern is by Thibaut Designs, and was bought from my favorite source for good quality, product knowledge, expert service, and competitive price – Dorota Hartwig at Southwestern Paint on Bissonnet near Kirby. (713) 520-6262 or dorotasouthwestern@hotmail.com. She is great at helping you find just the perfect paper! Discuss your project and make an appointment before heading over to see her. 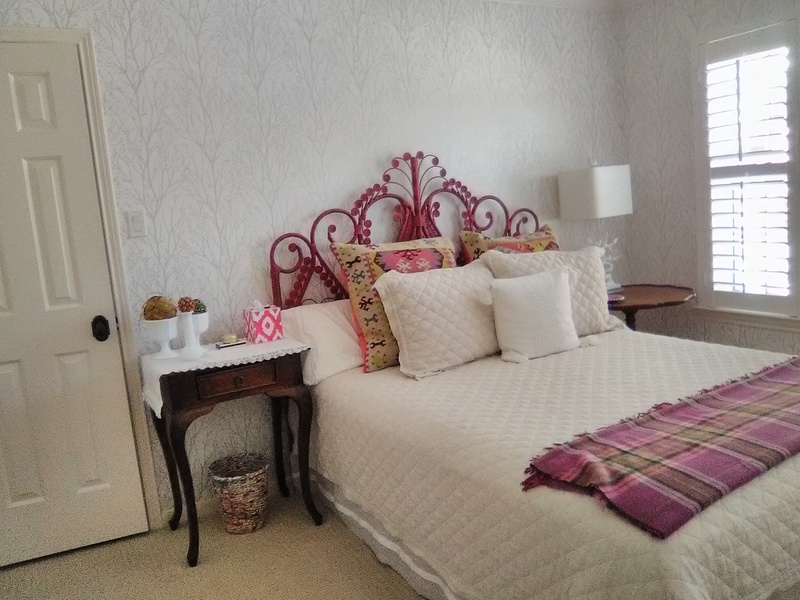 Silvery Guest Bedroom with Bright Pops of Color! 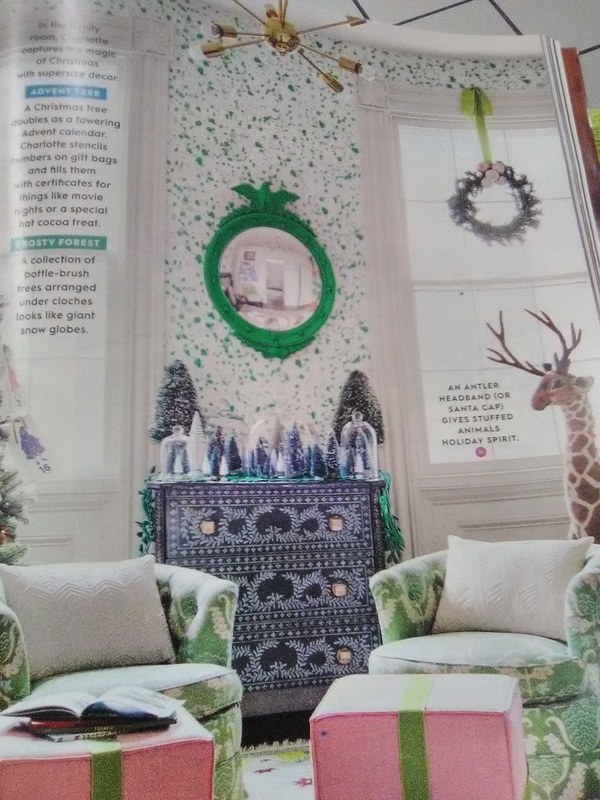 Two years ago, I hung this pearlized tree pattern wallpaper in the guest bedroom of a home in Bellaire (Houston). 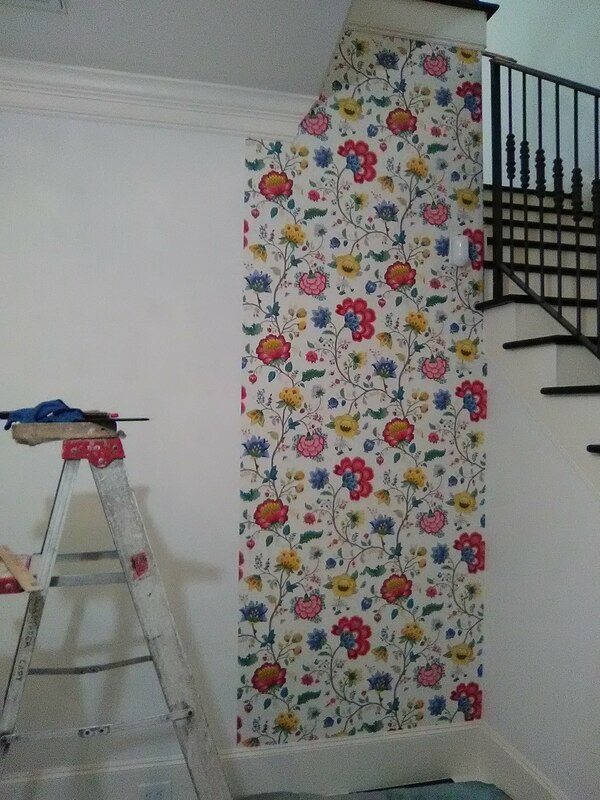 I was back yesterday to measure a few more rooms for wallpaper, and got a chance to snap this photo. I love the way the silvery trees fade into the background, and how the cranberry accents wake up the room with bright pops of color! 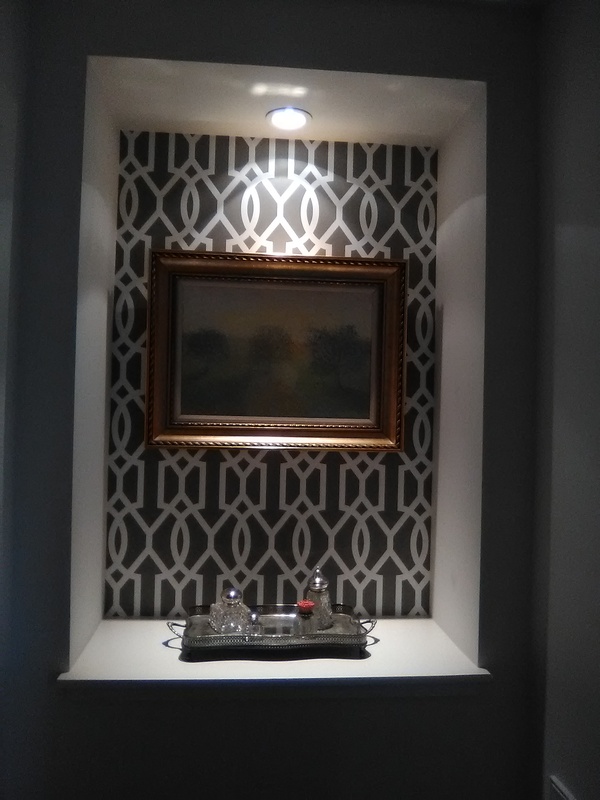 These homeowners were so thrilled with the two accent walls I did for them in their Montrose (Houston) townhome last week, that they had me come back today and use left overs to paper this art alcove. 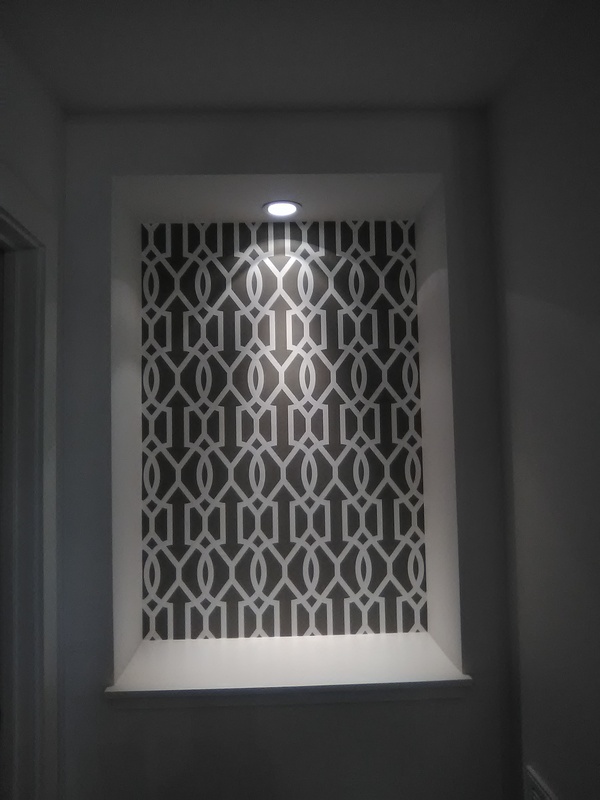 Even though the project involved only two 5′ strips, it took me several hours … note the perfect symmetry and balance of the pattern, both side-to-side and top-to-bottom. It all serves as a beautiful background for the art painting and silver service. And, since it’s the same pattern and color as used in two other areas of the house, it ties the various rooms in the home together. 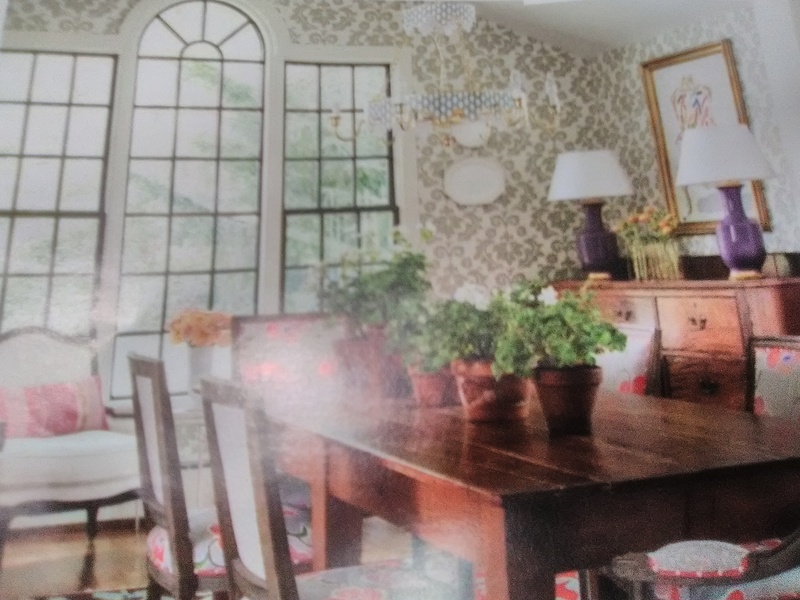 This classic trellis pattern is by Thibaut Designs is well over a hundred years old. “It makes my heart happy to walk in here. I’ve had neutral pallets for so long, I was ready for something cheerful and colorful and happy.” That’s what the mom of this 11-day-old baby girl said when she saw the transformation of her infant’s nursery. 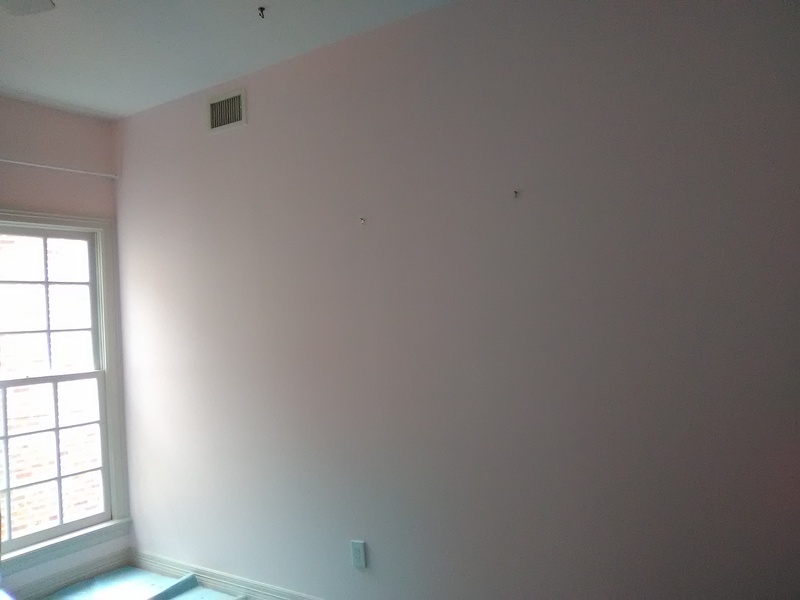 Originally all the walls had been painted a soft pink. Three walls are still pink, but the fourth accent wall is abuzz with color and critters. 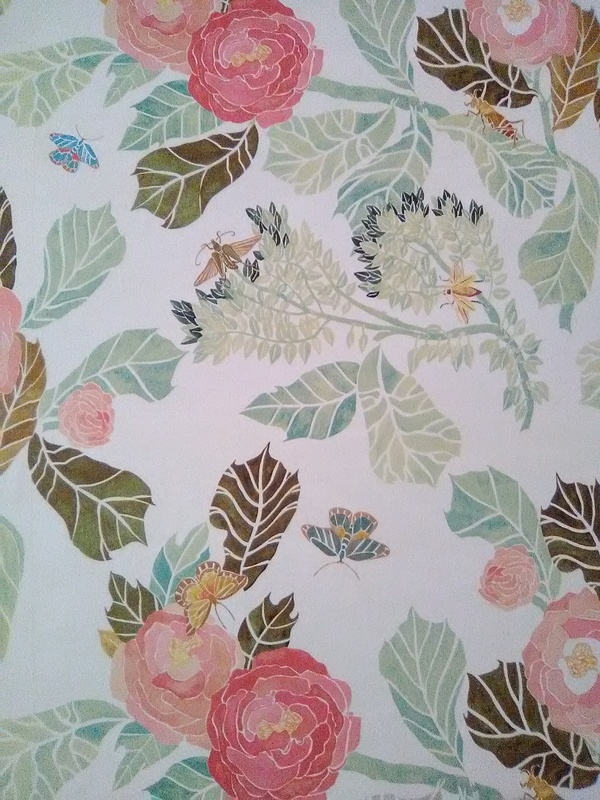 This cute pattern by Anthropologie (sorry, I musta forgotten to take a photo of the label) has colorful flowers in shades of salmon pink, and foliage in shades of green – but is also dotted with butterflies, grasshoppers, and other whimsical cuties. The mom noted how the design makes the room look larger. 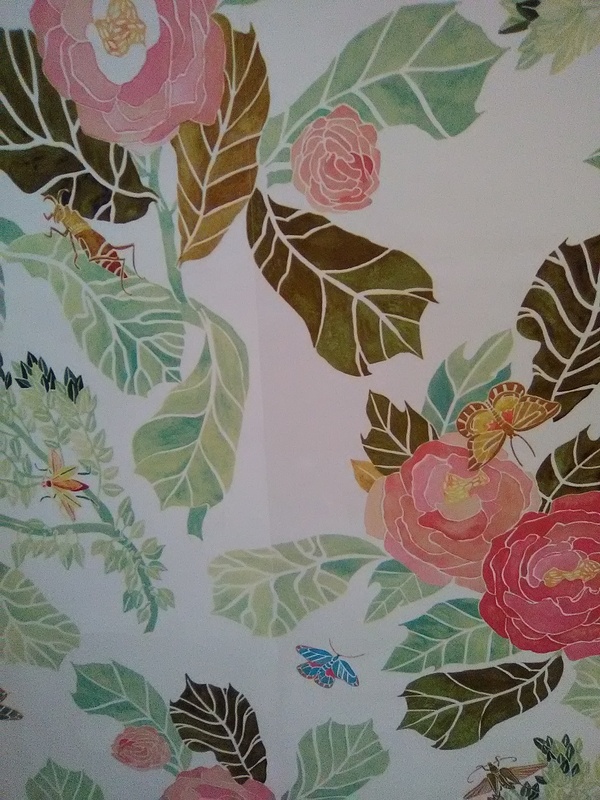 This wallpaper is sold by Anthropologie, and is made by York Wall, in their Sure Strip line. It is pre-pasted (water-activated), is thin and pliable and hugs the wall nicely, and is on a non-woven substrate which is designed to strip off the wall easily and with little-to-no damage to the wall when it’s time to redecorate. Sure Strip is one of my favorite products to hang. Most of what York makes is mighty nice, too. Originally this family was prepared to wait a few months for my next opening (I stay pretty booked with work), but I had a last-minute schedule change and was able to get their job worked in with – literally – only about 10 hours’ notice. Happy baby girl! How Wildly Colorful Can You Get? – Here It Is! 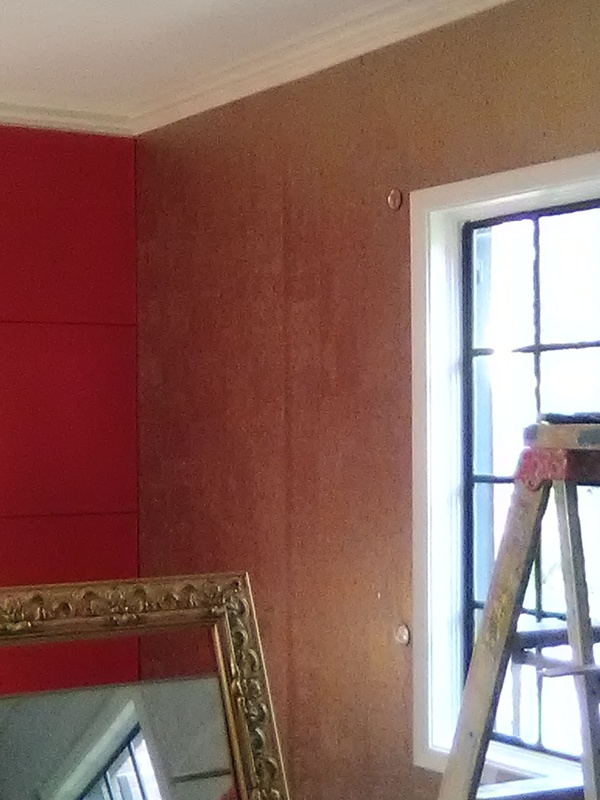 Just one accent wall (4 strips) in an entry in the Briargrove / Tanglewood neighborhood of Houston – but boy was it fun! This is one homeowner who is not afraid of color, that’s for sure! The third photo shows me laying it out on the floor, to determine the pattern match and how I want to plot the design layout on the wall. The designer is Manuel Canovas, and I believe the manufacturer or distributor is the British company Colefax & Fowler. It was a fairly thick non-woven material, and I used the paste-the-wall installation method. 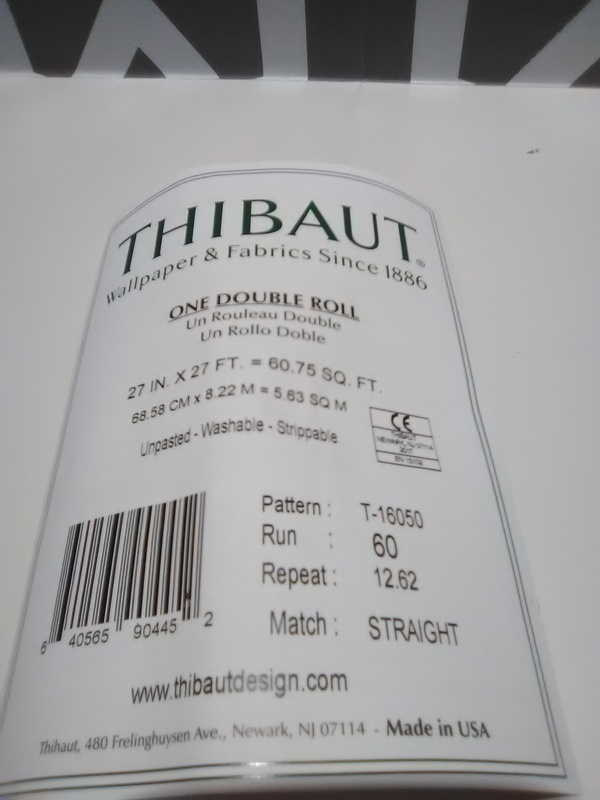 It is more durable and washable than most other types of paper. Homeowners are loving textured wallcoverings these days, and grasscloth is all the rage. However, I am almost always disappointed in this natural product, due to the visible seams and the lack of uniformity in color. The effect you see in the photo is called “shading” or “paneling.” Note the darker color of the second strip from the left. Click the link on the right to read more on my page about grasscloth. This newish townhome in the Montrose neighborhood of Houston is fairly traditional in style. But the new owner loves color, and she’s not afraid to be a bit daring! 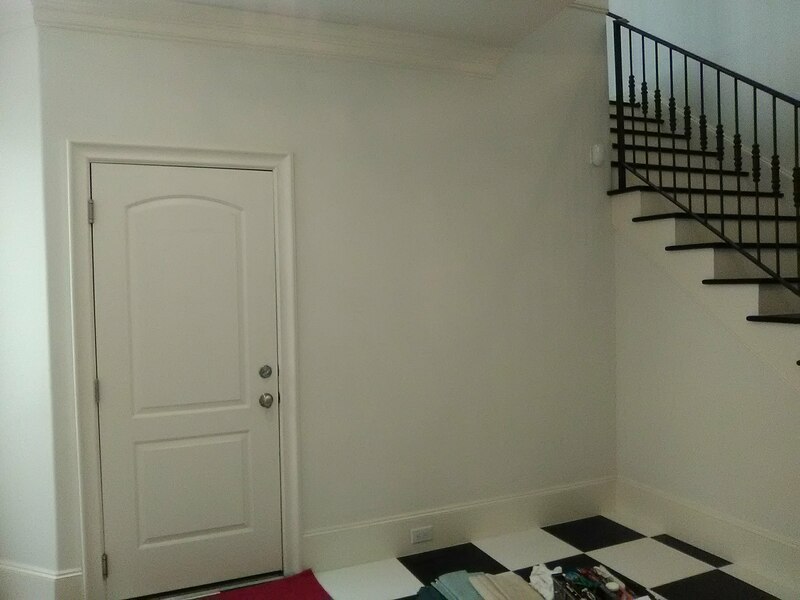 She had the ho-hum tan travertine tile floor taken out and replaced with this large, vibrant black & white checkerboard. 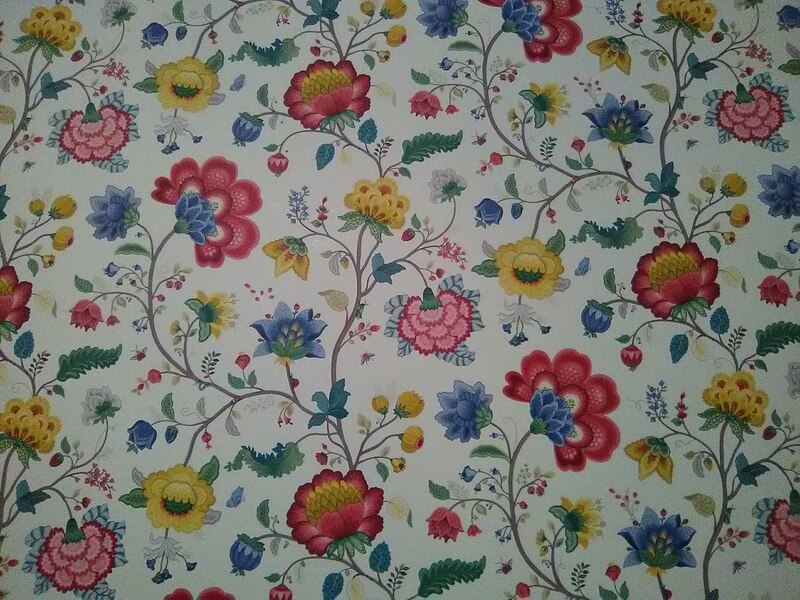 Next she woke up the walls with this vivid chintz floral wallpaper pattern. 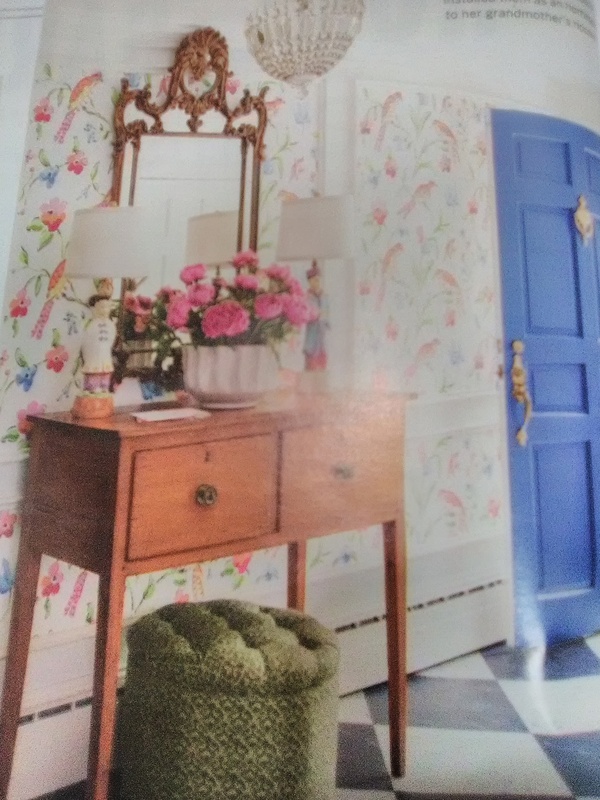 Chintz is an old and classic design – but there is nothing stuffy or old fashioned about these wild colors! I love the “in progress” shots (2nd photo) because they show the stark contrast between the original white walls and the drama starting to transform them. 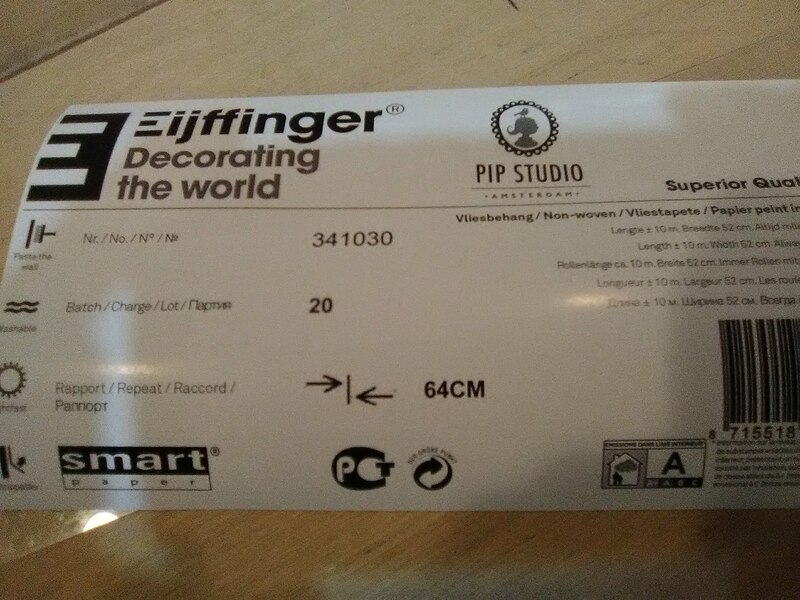 This wallpaper is by Eijffinger, a European manufacturer. 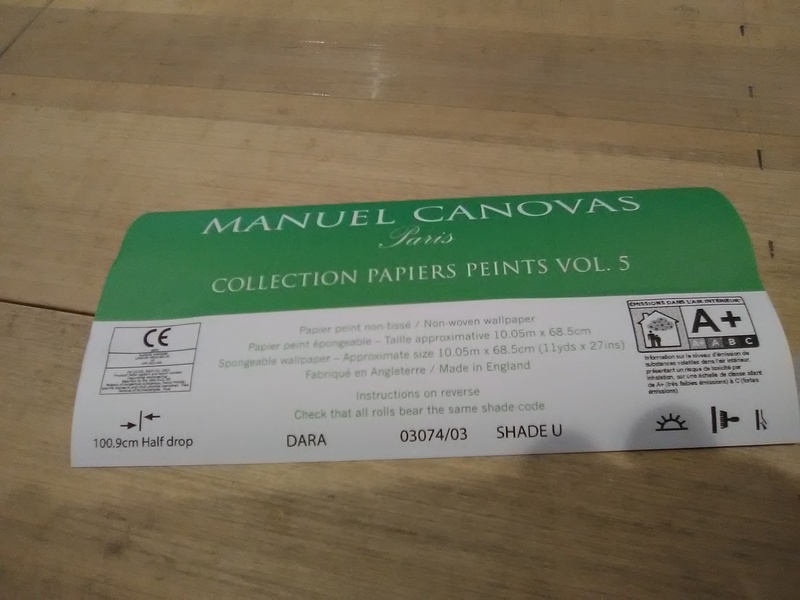 It is a non-woven material, and is intended to be a hung using the paste-the-wall method – but I prefer the results when I paste the paper. 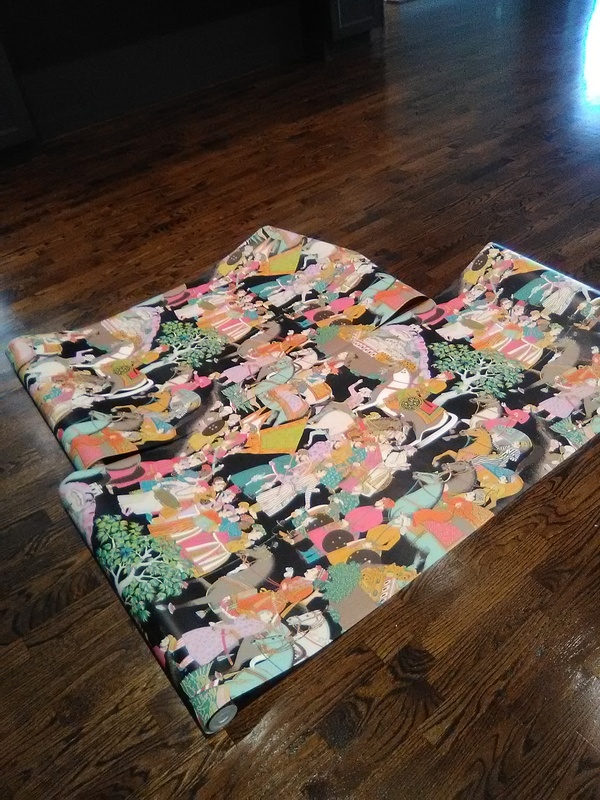 Re my previous post … The area to be papered was small, but the whole job was complicated because the grasscloth arrived in two different runs. 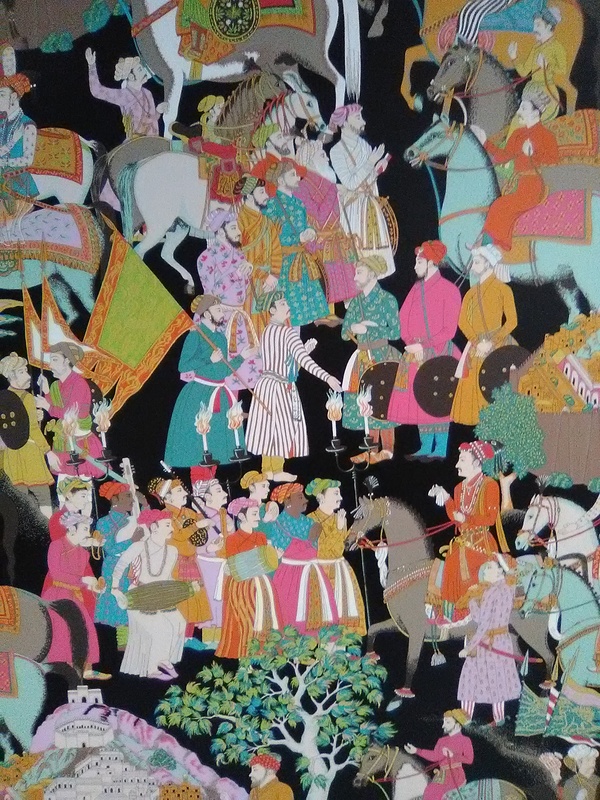 Run refers to paper that was all dyed / printed at the same time, with the same batch of ink. Different runs will be slightly different colors. The second photo exaggerates that color difference a bit, but still, it was pretty noticeable. That’s why you need to be sure that all your wallpaper is from the same run. 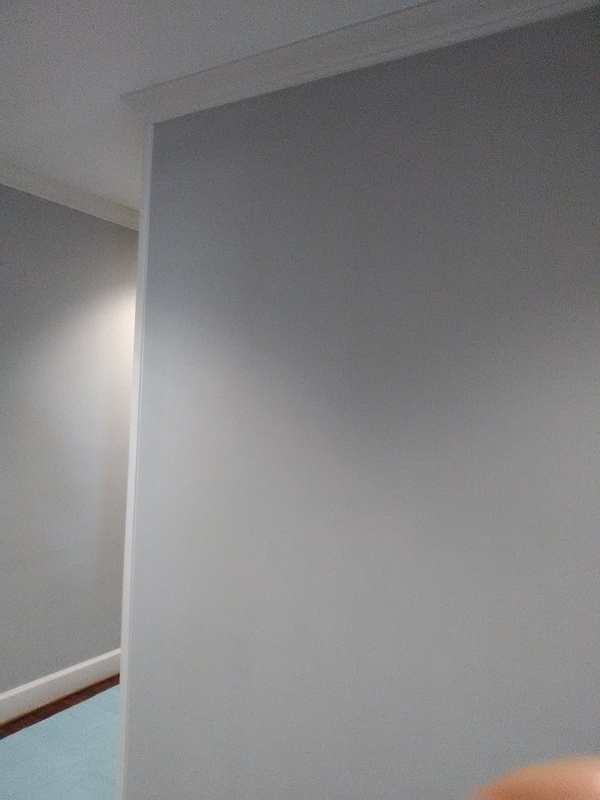 Somehow, Quality Control fell through on several levels, and I ended up with four walls to cover, a scant two bolts of paper, and two different color shades. 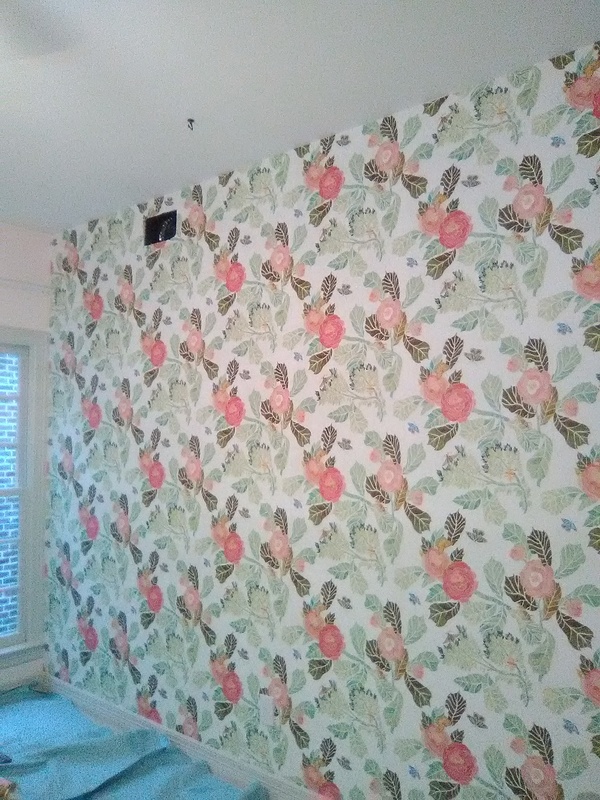 If two strips of wallpaper from two different runs are places side-by-side, you will see a big difference in color, which is what we call paneling (do a Search here for more pics and info). But your eye won’t notice a slight color difference if the two runs are kept on separate walls. So my challenge today was to figure out how many strips I needed of what lengths, to cover which walls, without mixing either of the runs on the same wall, all the while bearing in mind the length of each bolt of paper and how many strips I could get out of each. 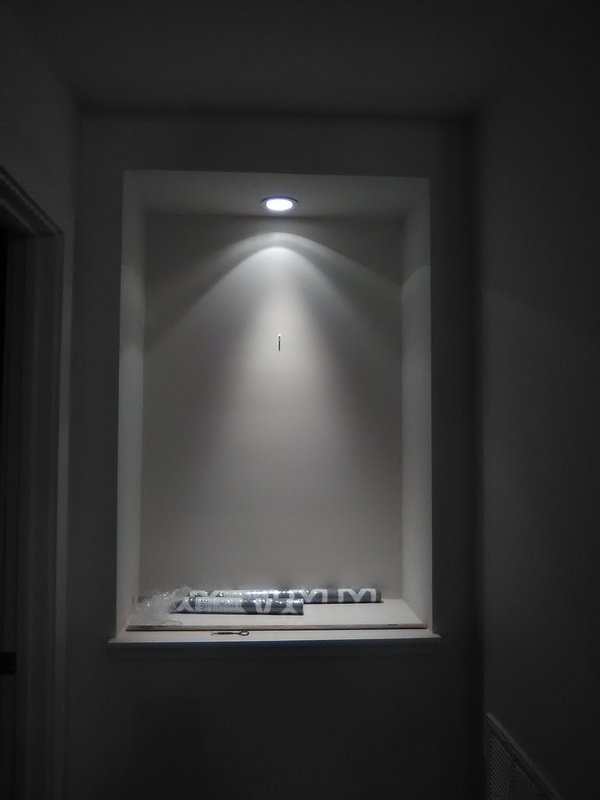 It took a bit of measuring, plotting, pre-planning, and engineering – which, to be honest, I actually enjoy – a lot. 🙂 In the end, I was able to cover all four walls without either of the two runs touching one another on the same wall. 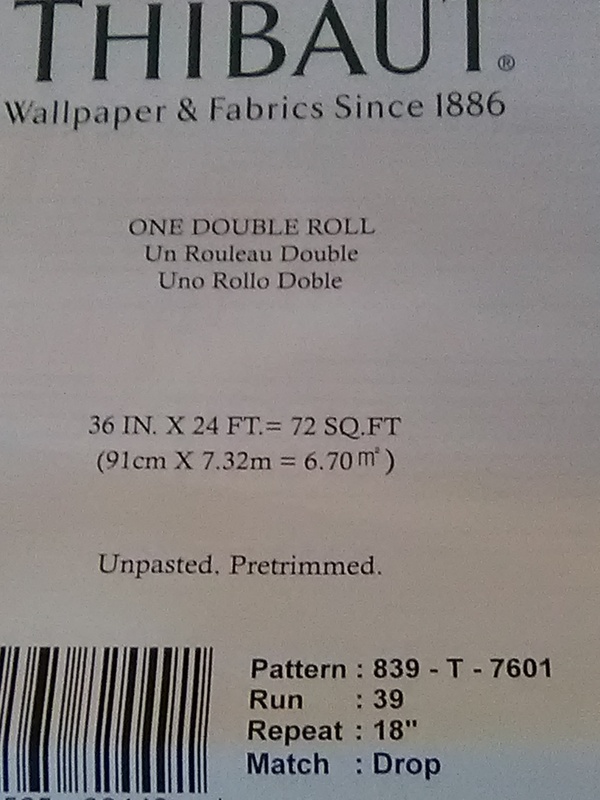 Once the room was done, you would never have known the paper had come in two different shades. The overall look was very homogeneous.